LVDT stands for Linear Variable Differential Transformer. It is most widely used inductive transducer that converts input displacement to an electrical signal. It consists of single primary winding and two secondary windings having equal number of turns and placed identically on either side of the primary winding. A movable soft iron core is placed inside a former upon which the windings are wound. 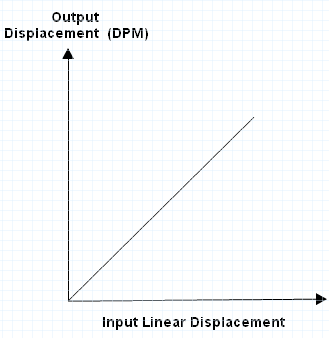 The block diagram of LVDT is as follows: The primary is excited by an A.C voltage of frequency 50Hz to 20KHz. The secondary are connected in series opposing when the core is placed in the null position and the output voltage is zero as equal voltages induced in the secondary cancel each other. LVDT primary, secondary windings are connected such that applied voltage on primary and induced voltage on secondary are 180° phase opposition as shown in the figure. If the core is moved to the left of null position more flux will link S1 than that of S2. A resultant voltage (Es1 – Es2) which is in phase with primary voltage will appear across the output. Linear Variable Differential Transformer(LVDT) has the advantage of having high sensitivity, high range, ruggedness, low hysteresis, and low power consumption. Connect the terminals marked “Primary” on the DPM to the terminals marked “Primary” on LVDT transformer. Keep the pot (P1) in “MAX” in the post anti-clockwise position. Caliberation of DPM:- The magnetic core is so positioned that the pointer is indicating zero position. If the DPM is not indicating zero, rotate the plot ‘MN’ to zero to get a zero on DPM. Now displace the core 19mm position in one of the directions. Adjust the ‘MAX’ plot to get an indication of 19.00 on DPM. Now displace the core by a small amount in range of ±19mm and note the scale readings and DPM readings. While connecting the terminals on DPM to transducer follow the color code carefully. Move the LVDT core in a gentle fashion by operating the knob for more movements.